The solid, or underlying geology of Tebworth is known as gault formation, a sedimentary rock formed approximately 99 to 112 million years ago in the warm, shallow seas of the Cretaceous Period. The superficial geology is mostly till – a diamicton formed up to 2 million years ago in the ice age conditions of the Quarternary Period. To north, south and east of the village are areas of head, a mixture of sand, gravel, clay and silt. Tebworth stands at some elevation, the road from Watling Street (the modern A5) to Tebworth having a pronounced slope. The area where Tebworth merges into Wingfield is the highest part of the hamlet, at around 443 feet above sea level. The Queen’s Head stands at 432 feet above sea-level and the former Methodist church at 435 feet. The foot of the slope in the area of The Lane is 393 feet above sea-level. The name means “Tebba’s enclosure”, Teobba being an Anglo-Saxon diminutive or nick mane perhaps derived from the name Theodbeald, Theodbeorht or the woman’s name Theodburh. 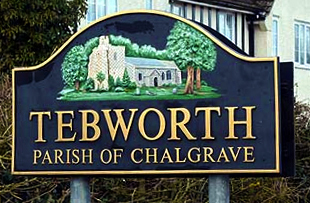 Tebworth has always been a hamlet of the ancient parish of Chalgrave. The hamlet is not mentioned in the Domesday Book of 1086 and no subsequent manor ever took its name. However, the village is mentioned in a charter of 926, along with Chalgrave. This was a local society in existence from at least 1750. The Book of Society Rules can be found here.